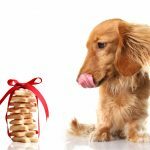 With so many people around, it can be difficult to make sure your pet doesn’t eat anything they shouldn’t. Take care of your pet this holiday season by keeping people food out of reach and following these tips if Fido cleans the plates. SuperVet saves a dog – and invites himself over for Thanksgiving dinner.